CSUN President Dianne F. Harrison. Photo by David J. Hawkins. State Sen. Bob Hertzberg (D-Van Nuys). Photo by David J. Hawkins. City of Calabasas Mayor David Shapiro. Photo by David J. Hawkins. The conference, which took place Jan. 11, offered strategies to help business owners, home owners and individuals shift their attention and resources to emphasize the safety of people and property following natural disasters such as earthquakes, fires, floods and power outages. 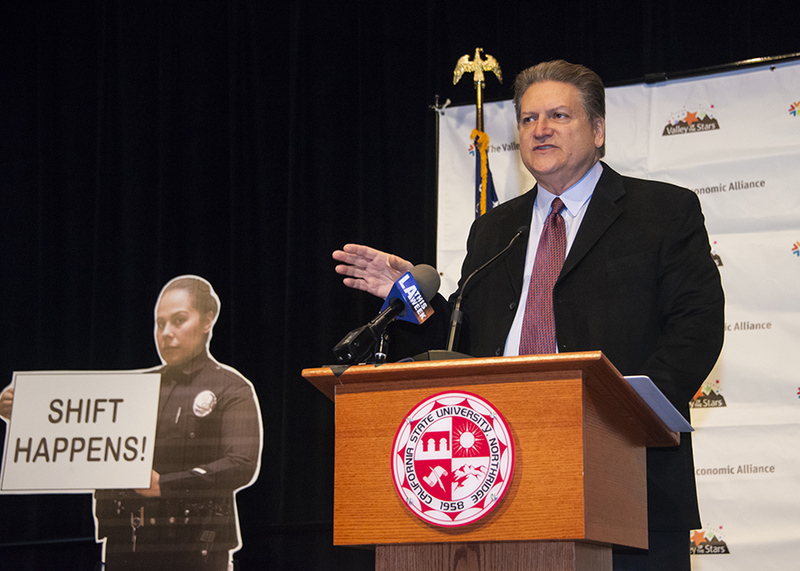 CSUN President Dianne F. Harrison joined keynote speakers that included State Sen. Bob Hertzberg (D-Van Nuys) and City of Calabasas Mayor David Shapiro to discuss the importance of being proactive in emergency preparation. 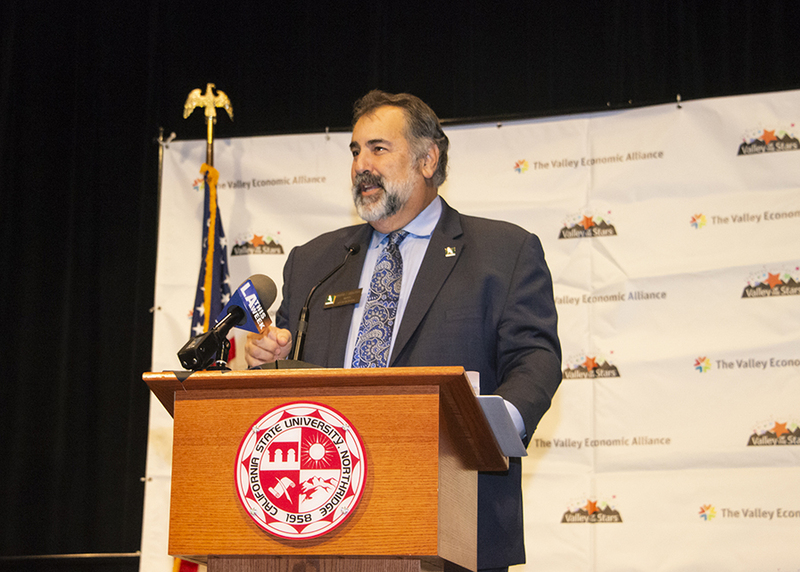 A goal of The Valley Economic Alliance is to ensure the region is prepared for challenges during and after a natural disaster. 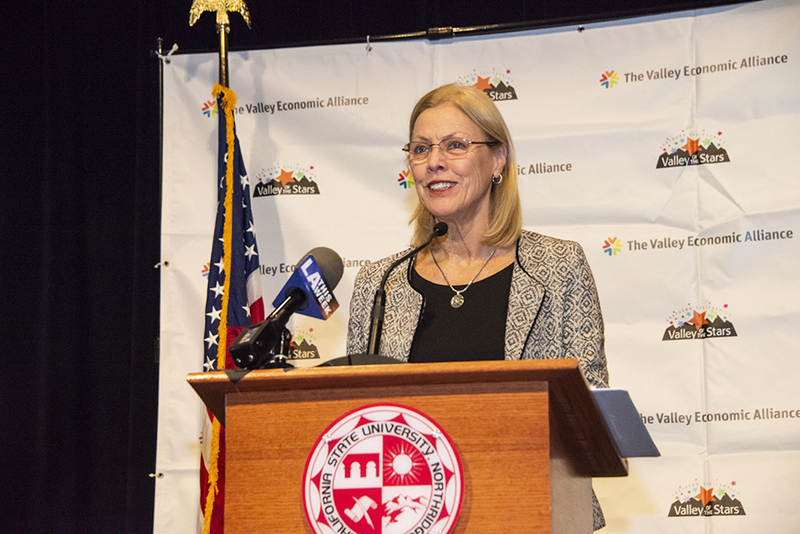 The alliance is comprised of businesses, government, education and community organizations that work together to promote greater standards of living and economic vitality in the Valley. CSUN’s Valley Nonprofit Resources offers both information and services to strengthen the more than 5,600 nonprofit organizations in the San Fernando Valley. Sessions at the conference provided advice for both individuals and organizations for staying safe during natural disasters. The tips included the standard “drop, cover and hold on” for individuals experiencing an earthquake, as well as big-picture advice for organizations, including detailed communication plans for employees, updating phone lists with employees’ home contact numbers and testing emergency plans. In December, Shapiro had a front-row seat to the damage caused by the Woolsey Fire. He shared his city’s experiences with emergency planning and stories of the recent disaster. In addition to natural disasters, the conference included discussions regarding man-made crises such as burglaries, home invasions and mass shootings. Captain Bryan Lium, commanding officer of the Los Angeles Police Department’s Devonshire Division, spoke about practical ways to help secure the safety of one’s business and home. He stressed the importance of keeping an emergency plan ready for each situation. To end the conference, Stephen Jordan, CEO of the Institute of Sustainable Development, a leading expert in disaster recovery and community economic development, spoke about the realities of natural disasters and their impact. Jordan said that private and public organizations must foster greater interdependency and interconnectivity in order to better respond to natural disasters. He referred attendees to a planning guide made available by the Los Angeles Economic Development Corporation that included strategies for shoring up both customer information and physical buildings.